Welsh Open top seed Peter Creed in action, Pic: Rhiwbina Squash Club. Welshman Peter Creed is aiming for home club glory in the third annual Welsh Professional Squash Open during May. Caerphilly-born Creed, ranked at 55 in the World men’s list, is number one seed for the 2019 event at his own club, Rhiwbina SRC in Cardiff. Former Welsh Open champion George Parker, who is one place behind Creed in the rankings, is number two seed ahead of Richie Fallows (London, WR 62) and American Chris Hanson (New York, 68). The Rhiwbina Welsh Open is an $11,000 men’s tournament and will run from Tuesday, May 7 until Saturday, 11th May 11. Squash is booming in Wales with Joel Makin, from Pembrokeshire, at a career-high 15 in the World and Rhyl-based Tesni Evans, the British Champion, at number nine in the women’s list. Newly-formed Welsh Wizards are playing in the strongest club league on the planet – Premier Squash League – and had Egyptian former World number three Mohamad Elshorbagy as first string. Wizards finished a highly creditable third in the South Division and are intent on winning the title next season. Big-hitting qualifier Parker, who plays out of the West Warwicks Club in the English midlands, won the Welsh Open title in straight games at Rhiwbina SRC two years ago, dropping only two games in four matches. He defeated top seed Joshua Masters 3-0 in the last four and teenager Patrick Rooney, the eighth seed, in the final. England’s Fallows won the 2018 Welsh title, beating Creed in the final. A packed attendance behind the glass-back courts at Rhiwbina SRC watched Fallows, then aged 22, win the final in straight games. Richie Fallows, the 2018 professional Welsh Open champion. Fallows, ranked 60 in the World, looked the sharper and fresher player with Creed looked drained after competing in the European Championships, Commonwealth Games and the Open. Creed plays out of the Rhiwbina club and club official Richard Murphy said after the final: “Peter gave everything he had, but it was obvious from the start that, despite his efforts, there was very little left in the tank from previous weeks. “He remains a true legend at Rhiwbina. “Richie did what he had to do and claimed his second World ranking title. His variety of play across the court was immaculate as was his show of humility after the match had finished. “Richie was a credit to himself and his family throughout the week. Both finalists spent almost an hour on court during their semi-finals. Creed won 12-14, 12-10, 11-7, 11-9 in 56 minutes, while Fallows beat holder and second seed Parker 11-8, 12-10, 3-11, 11-3 during a clash which lasted five minutes under the hour. 2017 Rhiwbina Welsh Open squash champion George Parker. Only £10 entry or £15 with an exclusive gift! Squash Wales pay tribute to one of their own later this month. Ross Scaccia, a leading member of the St Mellons and Llanishen clubs, passed away aged 66 in December, 2017 and a tournament was organised in his memory last year. Welsh squash official Byron Lloyd Lewis was close to Ross and says: “He was a friend of mine and a friend of squash. I introduced him to team squash. “Ross and Dave Williams, the ex-South Glamorgan President, asked me to form a team together at Llanishen. “This was the start of the modern day Llanishen teams and it has developed into a highly successful club, mostly down to Ross and Dave’s efforts. “Ross was also heavily involved in St Mellons squash would always try and support me in any event that I tried to organise. 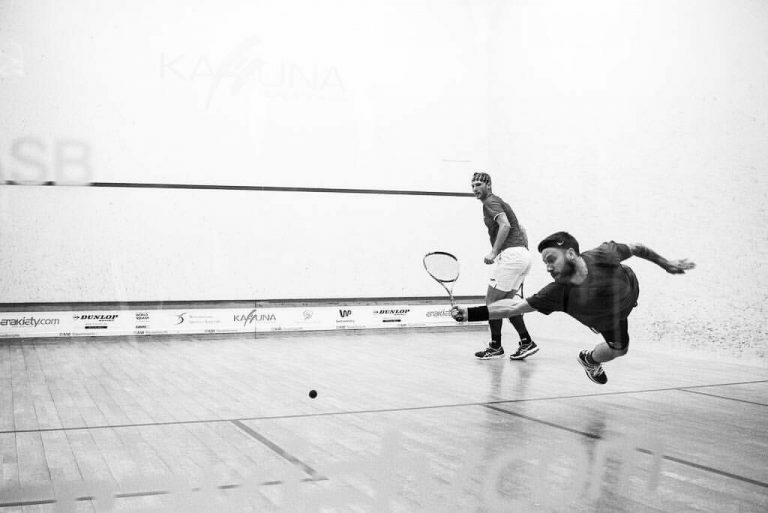 “In my eyes and in his own way he was a legend of squash. He use to call me ‘mother’. This was because when I started the squash team with him I was the only person who had team experience, so I use to be a bit bossy to the other players and look after them. “They would say I was like a mother to them. “Ross was affectionately known as ‘Barbie’ to his friends. This name was given to him because of his frequent barbeques. He invited my wife and I to some of them. “My wife and I are vegetarians and he would say ‘I’ll be cooking some cardboard for you both then’ – meaning Quorn fillets. “I also remember once when I went there that he counted how many profiteroles I had eaten. I know I have a sweet tooth, but he told me at the end of the evening that I had eaten 42 and that it was a South Glam record. I still think I hold it to this day. Entry for the 2019 is open until Friday, April 19. Cost: £10 entry or £15 with an exclusive gift! Mixed singles events: A, B, C and D. The finals, followed by presentations and buffet, will be at St Mellons on Sunday, April 28. Rhiwbina SRC’s Simon Dews was the first Ross Scaccia Open champion – and he also lifted the main trophy. There were four sections in the Scaccia tournament and the player with the biggest winning margin in their final was declared overall winner. Top seed Dews defeated Gary Fry 11-7, 13-11, 11-2 to win the A event title and the trophy. Dews won three matches in two days, beating James King 11-4, 11-7, 9-11, 11-3 and Sarah Clode 11-8, 11-7, 11-7 before overcoming Fry. A event: Simon Dews beat Gary Fry 11-7, 13-11, 11-2. B event: Justin Nemeth beat Carlton Chivers 8-11, 11-8, 11-6, 11-8. C event: Chi Yau beat James Jackson 11-8, 11-6, 11-9. D event: Les Stamp beat Ollie Cann. A event winner: Corey Kearns. B event: Keith Miller beat Chris Baker 11-9, 11-7, 11-3. C event: Lawrence Barry beat Julie Gibbins 7-11, 11-6, 11-6, 11-1. Welsh number one Tesni Evans is again a driving force in organising the professional Karakal Bangor Squash Classic tournament in North Wales. The first event, held last year, was won by Scotland’s Lisa Aitken, the number one seed who won against English qualifier Lucy Beecroft (England) 11-7, 11-1, 11-4 in the final. Lisa Aitken, the 2018 Karakal Bangor Classic champion. Pic: Squash Scotland. Dundee-born Aitken’s success in North Wales was her third PSA World Tour title since returning to action in 2017 following illness. After winning the $5k Bangor title, World number 65 Aitken said: “The most satisfying part of the event in Wales was dealing with being top seed.